Procrastination is a wrongful act of suspending the most important things for later time. In other words, procrastination is the practice of delaying the more essential work for later time period and doing the lesser important ones earlier. It is one of the biggest mistakes committed by most of the university students while writing their University assignments. This mistake takes placed when you do the less important work, ignoring the urgent ones for later. Thus, you have to rush for finish the essential assignments. These result in a lot of errors due to less proofreading and editing. Thus, if you want to get the best grades in your university assignments, you have to stay away from procrastination. The experts of casestudyhelp.com online academic service provider company can help you in doing so. How To Overcome Procrastination In University? 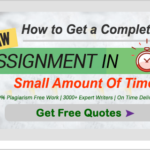 Divide your assignments into smaller parts: You can break down your bulk university assignment work into smaller subdivisions so that you can write the papers with a lot of enthusiasm. In this way, you can emphasis more on the introduction and conclusion part of your assignment papers. You can prepare your assignment paper in a more systematic and step by step manner by following this rule. Create an environment which is productive: While you are concentrating in preparing your university assignment paper, try to do all your work in a calm and quiet environment. This environment should be free of any kind of disturbances or outside noise. It should be an ideal place for assignment writing. You can seek for help: You can always seek for help from productive and helpful people to avoid procrastination. You can always discuss about your goals and ideas with the expert helpers of casestudyhelp.com online organisation. They will always help you in reaching your targets successfully within time. Refresh your attitude: Do not think your assignments as burdens. 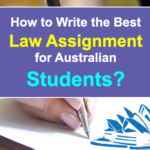 Thus, you need to change your basic attitude towards writing the university assignments. You need to keep in mind the fruitful sides of your assignments. This refreshed attitude will help you in avoiding procrastination. Set enough time for proofreading and editing your university assignment papers: Proofreading and editing are two of the most important tasks while preparing your assignment papers. Thus, you need to set enough time for proofreading and then editing the papers before the final submissions. You will not be able to do this if you wait for the 11th hour after writing the assignments. This might result in procrastination. Thus, set separate and definite time periods for proofreading and editing all your university assignment papers. Set definite time limits for your assignments: You always need to set a definite deadline for each and every assignment. You also need to follow all these deadlines and finish your work well before those deadlines. 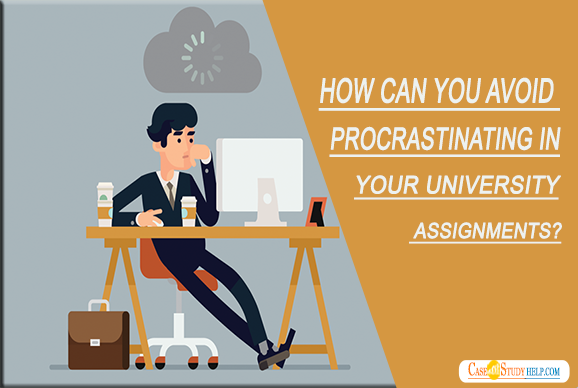 If you follow all the above-mentioned tips, you can definitely succeed in avoiding procrastination while writing your university assignments. Why to Avail Our Services? The process of availing all our valuable services is very easy. You just need to login our official website Casestudyhelp.com any time from any part of the world and place your order online by making online pay with the help of debit/credit cards. Our expert team is always ready to provide you with all kinds of tips and guidance in writing your university as well as the college assignment papers. Students round the world are very happy and satisfied with the top standard online services provided by our company. 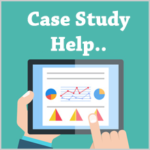 Casestudyhelp.com is one of the oldest as well as most reputed online academic writing help provider organisations. We have helped a large number of university students from various nations like: Australia, UK and USA. They are getting very high grades in their university assignments by following the procrastination avoiding tips provided by the experts of our organisation. The students are also performing very well in their university exams by availing our best essay, dissertation, case study, homework and coursework help services. Thus, Casestudyhelp.com is always the ultimate choice for you when it comes to your university assignment writing work. Lucy is the author of this blog. She works for Casestudyhelp.com online academic help service provider organisation for past 3 years. Moreover, she has long past years of experience in guiding the university students to avoid procrastination while writing their assignments.